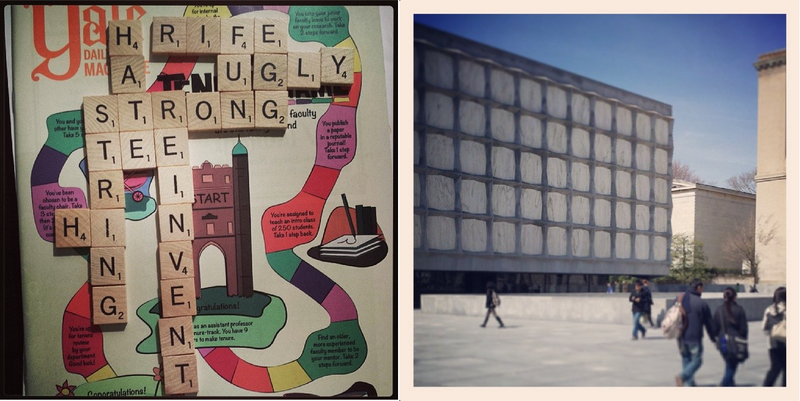 The Beinecke Library will temporarily close next year. 50 years old and having never seen a good renovation, the building’s ugly innards need to be examined. I worked there for about a year and a half, deep under this modern stone-walled building. It is beautiful, it is elegant, it is important. It also needs to be gutted and strengthened from the inside out. It doesn’t need a whole reinventing, but it needs to a renovation. As I whirl from the news of not getting into any PhD programs, I wonder when and where to apply again. How do I reinvent myself? What were my weak points? What were my strong ones? What schools would I be happy at? What schools would I hate? What do I do next? These are, of course, also existential questions that I use to string myself along. Another thing that needs to be reinvented is the tenure track at Yale. One of the few universities where it’s still virtually impossible to move from tenure-track to tenured, Yale loses its junior faculty at what I assume is a faster pace than most places. At other universities, there aren’t even tenure-track positions to go through before being denied tenure. And yet, in a time rife with denial and rejection, I continue to try to be strong and persevere. I want to teach. I want to write. I want to get there.